A forum series intended to bring together NASA scientist, politicians, and targeted members of the general public was not achieving the desired results. Robert's solution was a "we-gotta-get-'em-to-come-before-we-can-preach-to-'em" approach. Robert mixed h igh profile personalities with NASA "stars". The result was standing-room-only, global television coverage, and front page headlines for what had previously been a mundane NASA educational event. A national TV broadcaster, a senior NASA scientist and a superstar helped propel this NASA event to "walking on the moon" status. 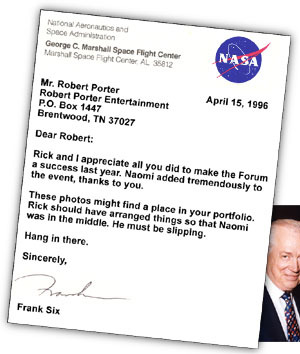 Hugh Downs, Rick Chappell and Naomi Judd joined with Robert to make NASA's star brighter. 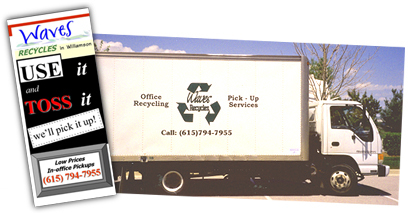 Robert relied on fresh ideas along with his graphic design skills and entrepreneurial abilities to gain new customers for Waves recycling business. Robert used tools like Chamber of Commerce promotional packets, brochures, vehicle graphics, and community event tie-ins. 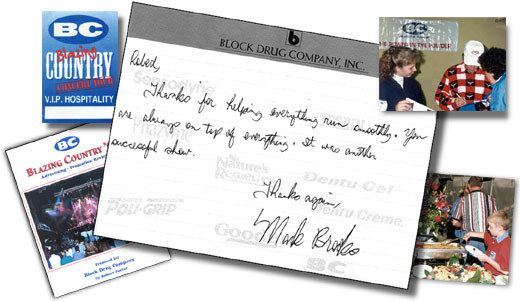 Block Drug / GlaxoSmithKline sought out Robert to help counteract rival marketing strategies.What he brought to the table was a five-point proposal to lead the consumer / brand relationship into a great marriage. FIVE: Incentive retailer promotions to enhance friendly exchanges of company product and consumer money. The results: A long-term relationship between Robert and Block. "services to be rendered by Robert Porter [include] coordinating, arranging, negotiating and contracting with performers and personalities, electronic and print media, venues, catering services, [and] on-site personnel"
Robert transitioned his knowledge of "working with people from most walks of life" and from many countries into further successful career experiences to include teaching, assisting senior retirees and facilitating resort programs. Robert enjoys working with people of all ages.